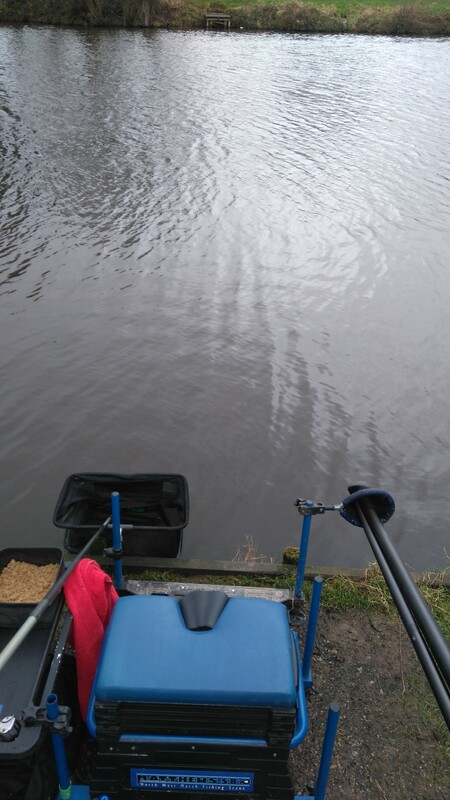 Today was the last round of Diggle AC winter league at Old hough and we was due to fish on Boulders + Goose which i was happy about as these waters had fished a lot better during the series of matches , i was in a good position towards the top of the league table and i was looking for a draw which would give me a chance of a few fish to consolidate it but in the back of my mind was that i could draw in one of the poor areas because there was some pegs that had not produced all winter . The weather leading up to the match wasn’t that bad for the time of year a bit cold but nothing to worry about or so i thought as i made the thirty mile trip to the venue the temperature just dropped and dropped , when i got of the motorway it was think with frost then i spotted the odd duck pond in the farmer’s field frozen over not what i wanted to see and i was hoping that the lakes at Old Hough wouldn’t be the same but as i approached the lakes we would be fishing majority of it had a lid on it ! ! After unpacking the van the rest of the anglers were in deep discussion on what we should do and it was decided that we would break the ice on all the pegs in the draw bag so nobody would have the disadvantage of doing it on their own we also delayed the all in till 1030 , as everyone mucked in clearing the ice we soon had the pegs clear but i did notice that the flyer pegs 16+18 on Goose and pegs 20+5 on boulders were already free from ice and would no doubt be the pegs everyone wanted i know that i did . On the left hand side i will be using pellet because the last i fished this peg that is where i managed to pick up the bonus carp , i will be using a 4×14 malman roob float with 014 garbo main line and a six-inch length of 010 garbo hook length attached to it was a size twenty matrix silver fish pattern , i would feed the swim with a kinder pot of micros and ground-bait every thirty minutes occasionally dropping on it during the match although i wont be wasting too much time on it as i am only expecting the odd bonus fish . 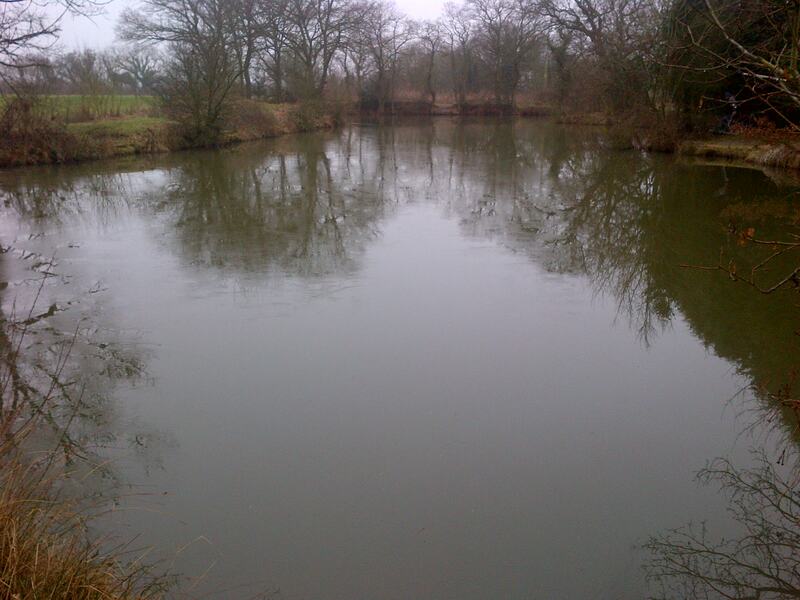 On the right hand side i choose to use maggots because i think this will be the best bait to use today it is also positioned towards the open water which was not frozen so obviously not been disturbed by the ice breaking and i expect this to be my most productive swim due to the cold conditions . 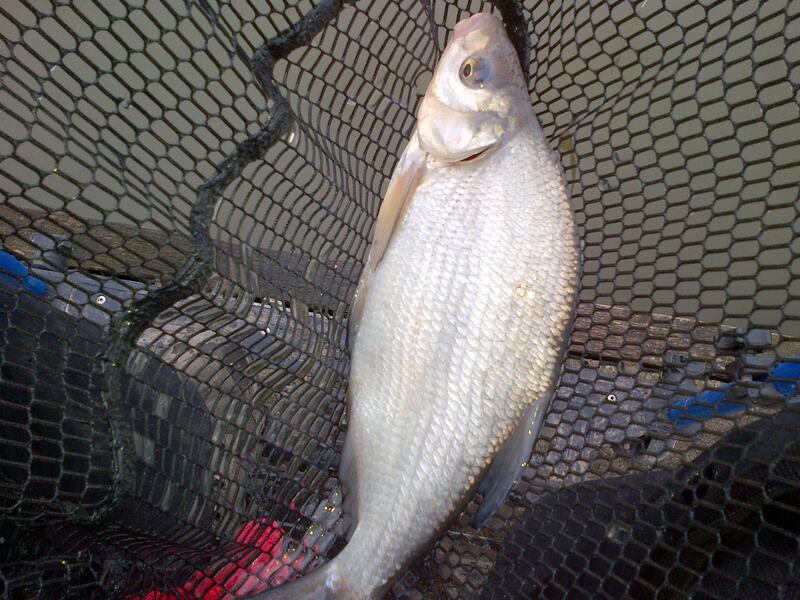 i am using a 4×12 RW maggie float with an on the drop shotting pattern allowing for a slow fall of the hook bait my main line was the usual 014 garbo and hook length was a slightly lighter 008 which had a size twenty matrix silver fish hook attached , i decided to feed this swim with half a cupping kit of maggots every half hour and top up through a kinder pot when fishing it . Along the far-bank i was in a bit of a quandary on which depth to start in and finally settled on three-foot which was a couple of feet down the slope , i used a 4×10 RW maggie float with an on the drop shotting pattern my main line was 014 garbo and hook length was 008 garbo which had a size twenty matrix silver fish pattern , i started off tight to the ice towards the right and would began feeding by trickling in maggots through a kinder pot this would hopefully attract the attention of any passing fish without over feeding them . I also had a dobbing rig set up to push in between the reeds this would hopefully pick up a carp or two i used a 0.3 matrix series three float which had two number 11 stotz spread down the line the rest of the shotting was under the float , my main line was 014 garbo and i had a slightly stronger 010 hook length with a size 16 matrix bagger hook attached as it was only two foot deep i left a longish line between float and pole tip so as not to scare the fish off . 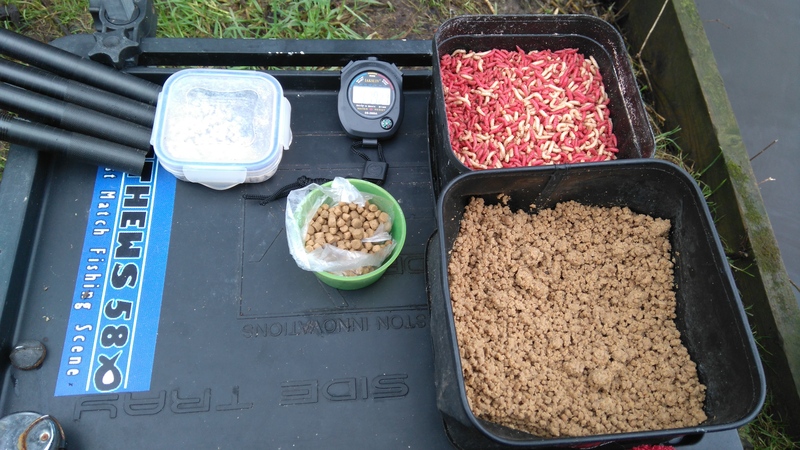 On my bait table i had a mixture of pellets and ground-bait but will be mostly concentrating on maggots as i expected chub+ide to be the main species i would be targetting today , i also had a couple of slices of bread for dobbing . The first two hours of the match where really slow going as i only managed to catch a couple of chub one on my maggot line tight to the ice and the other dobbing bread , but even though i worked all along the far-bank with both rigs i failed to get a single indication and it was the same on my channel swim which wasnt that surprising as al the ice had started melting lowering the water temperature and dropping to the bottom of the lake . With things not working as i would have liked on my three-foot line i got off my box and set up a 4ft rig all the lines + hooks were the same i just upped the float size to a size 4×12 RW maggie yet again i began by drip feeding the maggots in but this didn’t get the desired response so with nothing to lose i began feeding quite heavy using a small kinder pot every five minutes and out of the blue i had three quick fish then nothing . 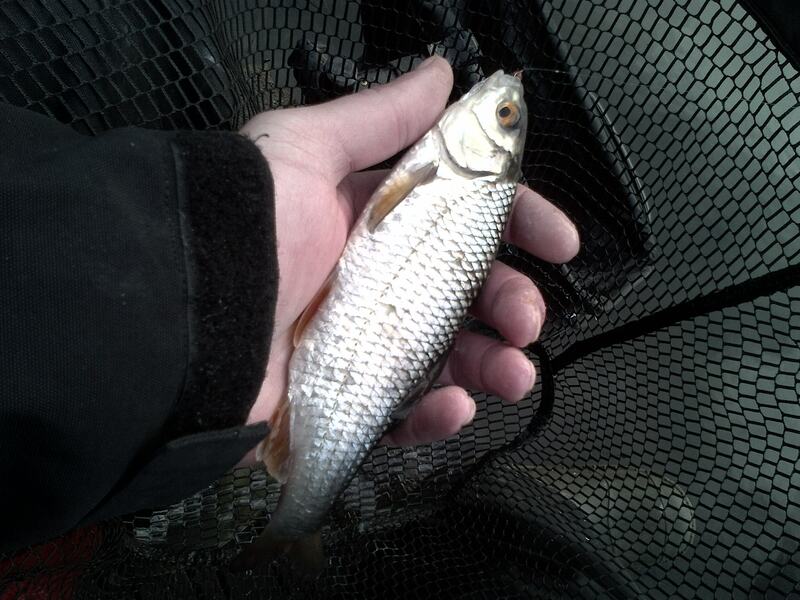 With the temperature gradually increasing i noticed a few fish top along the far-bank and i decided to give my three-foot rig another try , this produced a chub straight away taking the bait on the drop so out came the catty and i managed to sneak a couple more out by rotating between the two lines i managed a dozen chub+ide .In the last forty minutes the sun went behind the clouds making it feel a lot colder and all my indications stopped so i decided to spend the remaining time on my channel swim this would also give me chance of a bonus fish but the only bites i could manage were from tiny skimmers and when the all out sounded i was unsure how i had got on because i could only see a couple of other anglers . 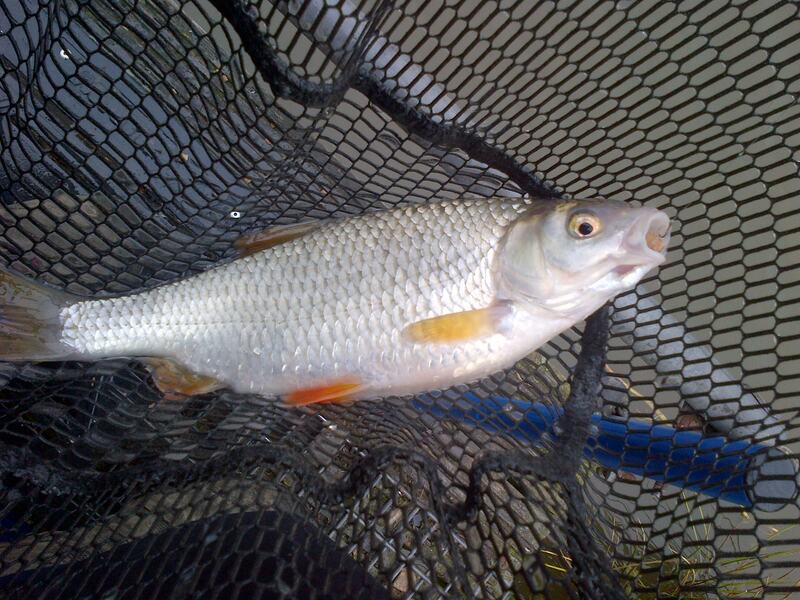 As i began packing up the scales came round and i was the first to weigh in on my lake the 12 chub+ide plus a few skimmers went just under 7lb which was about what i thought , the conditions really put paid to any chance of getting a decent weight and i felt that i never got to grips with the peg as drip feeding did not produce then when i fed a bit heavier the fish i caught were spewing up maggots ! ! Peg twenty was the next to put his fish on the scales which took the lead with 10lb and he caught all his fish under the bridge were the water must have been a couple of degrees warmer , the next couple of anglers really struggled as they failed to break 3lb and the last angler to weigh in put just over 7lb on the scales to knock me back down to third so for the second match running a matter of ounces had prevented getting me a better finishing position which i knew would cost me in the league . 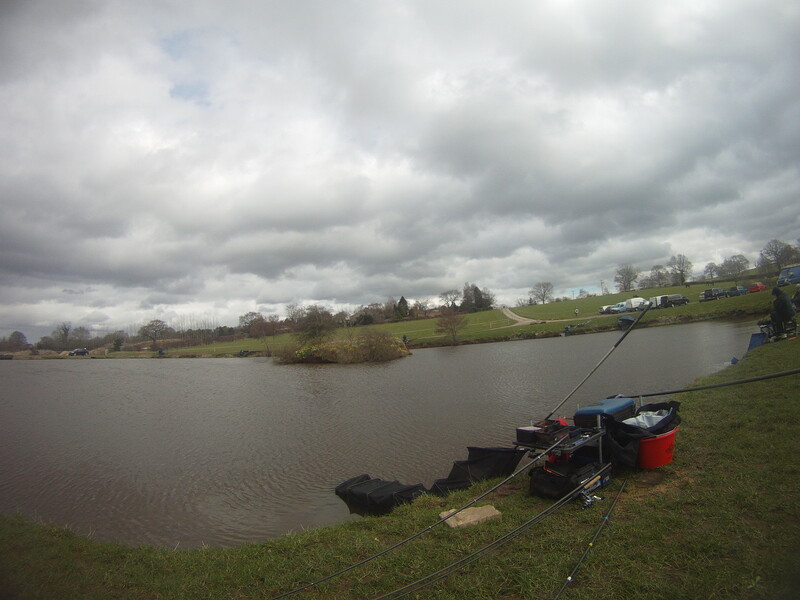 So like i originally thought my last couple of matches were i just missed out had cost me a better finishing position but to be honest the real damage was done in the earlier rounds when i fished some shocking matches as i was getting used to the venue because i had not been here before and was expecting it to be your standard f1 fishing not the un orthodox chub+ide but you live and learn . With the weather being forecast to be pretty awful today i was in two minds whether to venture out or not and only decided to go late on sunday morning because the heavy rain + strong wind had not materialized just yet but I’m sure it wasn’t far away , so with a match obviously out of the question due to my late start i settled on the ever reliable Heskin hall which is somewhere that i don’t fish a great deal but is a belting silverfish water rammed with skimmers although it is only a twelve peg water but you’re guaranteed a few bites . So after picking up a couple of pints of maggots i headed off to the other side of Wigan into the country side of Heskin as i arrived at the farm i was surprised to see a few cars knocking about and after unpacking my van i headed off across the field to pond one it was rather hard work pushing my trolley across the muddy ground and i was huffing+puffing when i finally got to the pond , luckily i was the only person on it so i had the choice of pegs and i didn’t fancy sitting under the trees because when it did begin to rain it would last or feel a lot longer with the drops coming from the leaves even though these are probably the best pegs to fish , i had a walk round to the other bank which although was more open to the elements the pegs were situated closer to the water with a bit of a bank behind allowing for the wind to blow off my back and over my head i also chose one that had a bush to my right which also helped in protecting me from the elements . Maggot rig which i situated at an angle to my left at five meters out after plumbing up i found it to be five foot deep so i used a 4×12 rw maggie float that had a strung out shotting pattern of number eleven stotz , main line was the usual 014 garbo that had a six-inch length of 009 garbo hook length attached my hook was a size twenty matrix silverfish hook and elastic was size six preston slip . Pellet rig i put this towards my right at the same distance yet again it was only a touch over five foot but i decided to use a heavier 4×14 malman roob float which had a double bulk shotting pattern , my main line was 014 garbo and i used a short three-inch hook length of 010 garbo attached was a size 18 matrix bagger hook elastic was a size six preston slip . 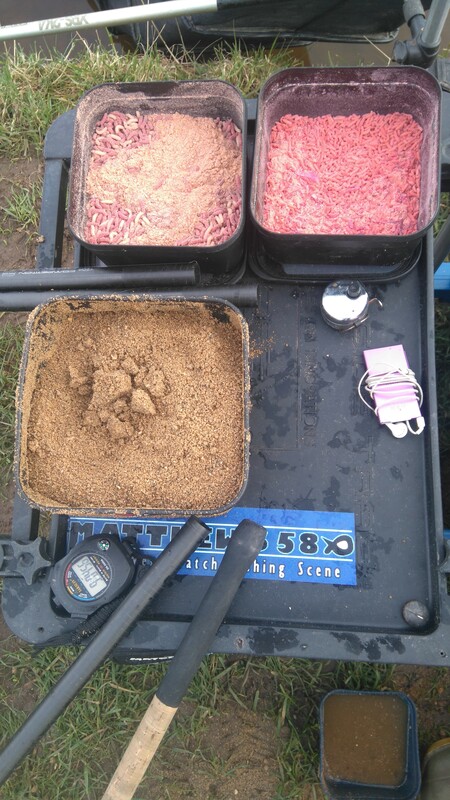 At eleven o’clock i was ready to get started and before going on my maggot line i fed a full small cupping kit of micros i would top this up with half a cup every twenty minutes , leaving it to rest for at least an hour allowing the skimmers to settle on it which is always important if you want to catch a few fish . Picking up more maggot rig i decided to trickle a full small kinder pot after every fish or every five minutes which ever was the earliest , i know loose feeding would have been better but the wind was gusting from right to left meaning i couldn’t group the feed as i would have liked , first drop and my bait didn’t even reach the bottom before a finger length roach took it a further five quickly followed and i needed to have a re-think on how i presented my rig i changed my shotting pattern for a more positive bulk+dropper and with so many small fish present i figured that there wouldn’t be a great deal of bait getting to the bottom so i changed kinder pot for the next size up and tapped it all in at once . By altering things a little i finally got my rig to reach the bottom were the bigger silvers were waiting and i went on a little run of catching fish up to 8oz after about half an hour bites seemed to tail off a bit and i had held my rig tight against the slight under tow but after allowing it to travel through my swim about a foot i found the fish again going on another little run . After an hour i was eager to give my pellet line ago hoping that the bigger skimmers had been given enough time to settle and after lowering my rig in slowly i held it directly over the micros , i didn’t have to wait long before i had a classic skimmer bite as the bristle of the float came lifting out of the water and i soon had it in the net at around the pound mark it was a good deal bigger than those on my maggot swim , a further dozen followed of similar size plus a few smaller hand sized fish in the next sixty minutes to be honest it was just like shelling peas and i was really enjoying myself in the countryside it was miles away from the hustle+bustle of the big matches i had usually been attending , sometimes its just nice getting back to basics and fishing like i did when i first started many ,many years ago i even saw a kingfisher working along the opposite bank i had not seen one of those for many a year . During the two hours i had fished the weather had got gradually worse with the wind changing direction blowing directly in to my face plus the drizzle had started but this had no real effect on the fishing but it did make my short number four section stick in my top kit which made my life a bit more awkward , a quiet ten minute spell on my pellet line then the float shot under and a firm strike resulted in yards of my size six elastic streaming out of my pole it was no doubt one of the many carp in here which grow into double figures after what seemed like an age with the fish ploughing through both my swims multiple times i finally had it under control and i was just about to net it when the hook pulled causing my rig to tangle the ten minutes i spent untangling it at least allowed both my swims to settle back down . 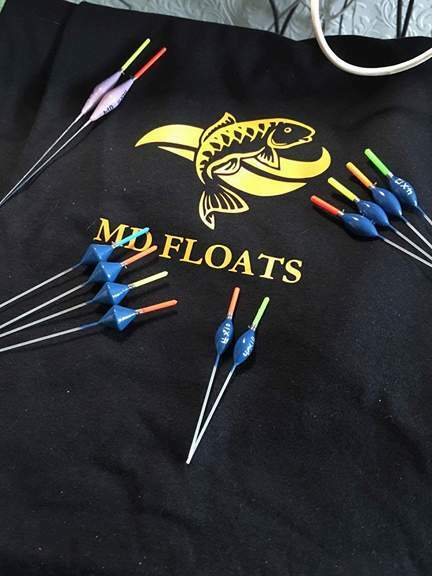 As i mentioned earlier with my pole getting stuck i could only use the one rig on both swims plus i couldn’t use my cupping kit so feeding my pellet swim took a lot longer than before so after taping in four lots of micros i went back on my maggot rig , i had altered my shotting for a bulk + dropper and i was soon back catching hand sized silvers one a chuck just like before . 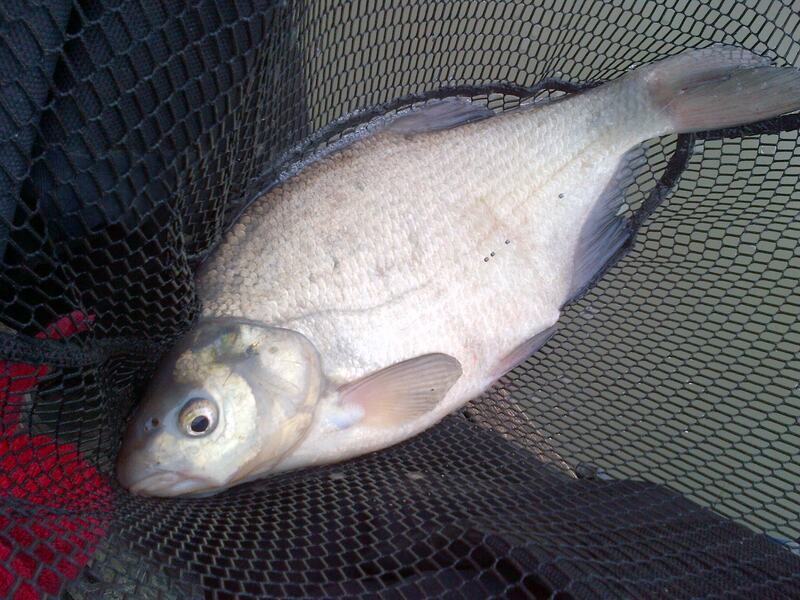 With thirty minutes of my session remaining i decided to spend it on my pellet swim my first couple of fish were small skimmers and i feared that the bigger ones had drifted out of the peg with the disturbance of the carp but gradually the stamp skimmers returned , i managed another half a dozen before i landed my biggest fish of the day which was a bream of about three pounds and as the rain had relented a little i decided to call time on my short three-hour session i was soaked to the skin but had really enjoyed it , i ended up with thirty fish over ten ounce plenty of those hand sized skimmers plus rafts of tiny fish at the start before i worked out how best to catch the better samples . I did take another video which i will be putting up in the next couple of days and any constructive feedback will be greatly received because it’s all relatively new for me at the moment , i am going back to Horns dam winter league on Sunday to fill in for my mate on Jeffs team this time i will be fishing the dam itself which is another new water for me to try and i have heard it’s all small silvers plus the odd bigger skimmer so i should get a few bites fingers crossed .